These voile curtains are beautiful. They arrived folded neatly which once I opened them they had fold lines so I popped them in the dryer for 10 minutes and they hang perfectly. Great value! Hang these Pairs to Go curtain panels to bring a cheery touch to your window. These voile panels have a sheer design, so they allow some natural light to penetrate your room. LOVE! That these come in a pair at such a great price!! It’s such a hassle to have to buy multiple panels for the same room or window! These look great & make it easy!! I needed several of these wide panels for a sunroom and they worked out well for such a reasonable price. I bought the taupe in 63". I was very pleased because it is difficult to find that color in 63". The color is a true taupe. Nice material. The panels were the correct length. I would buy these again. Perfect alone or paired with a set of curtains. I love the ivory color. They are truly ivory not beige or soft yellow but truly ivory. They hang great and make a great statement in the room. I would definitely recommend ! I love these sheer curtains ! They were the perfect length for my windows and the taupe color matched my comforter! I highly recommend this product ! These curtains are a very vibrant turquoise color. They are the perfect length. They are sheer and let the sunlight in. They brighten up the room. Would recommend buying these curtains. 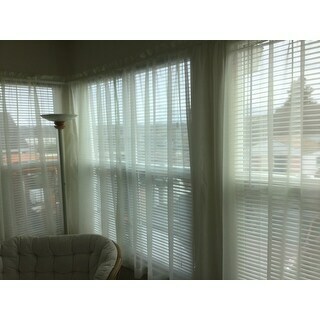 I ordered 5 sets of these curtains in white to use as a base for all my windows with a double rod. It's perfect since it gives just enough window cover as a base window treatment! I ordered these for my daughter and they are very pretty. Quality is good and a good bargain for a pair. I'm going to order a pair for myself! My wife loves these curtains. The quality and size are perfect and just what I expected. I am so glad I chose this panel pair!! These arrived quickly and look beautiful. They hang nice and flow well, with just a little bit of light filtering and privacy achieved. These sheers are perfect and exactly what I needed. I purchased white adn they are perfectly white. They are exactly as described which helped me to buy exactly what I needed. Great Value with pairs. Nice sheer curtains!! Good price!! 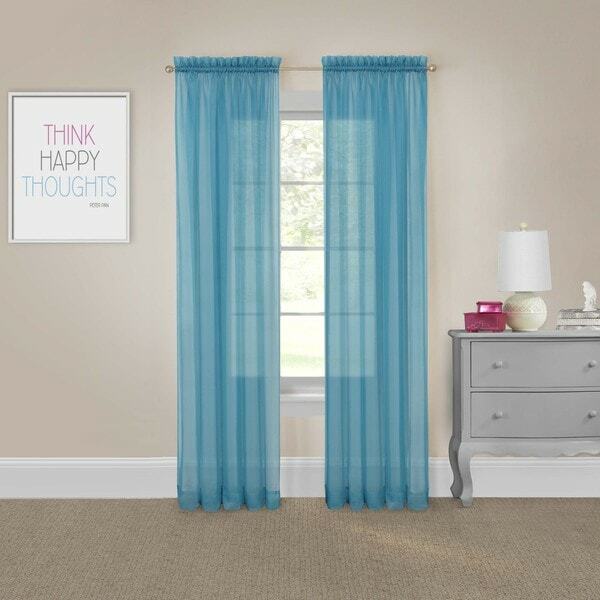 Polyester sheer curtains bright turquoise color as described on Overstock on line ordering system. Really nice, light-weight sheers. The measurements are accurate. Using these to cover an unused doorway. Just enough coverage but not too heavy. And how in the world would you ever beat the price? These are not as sheer as I had anticipated, but they look lovely in my sunroom (ordered the white). I like the colors and materials that the company had used. ?The price is responsible..As always everything is great that I purchase thanks Over stock! Bought these in taupe and they are great! The aqua color is absolutely perfect for my coastal decor living room theme. The color of the panels is exactly as pictured. After steaming and hanging them I'm quite impressed with the lively pop of color and the light breezy feel the sheer panels lend to the room. Highly recommended for the price too! "Are there 2 in a package"
"I want to buy Item #20741248 in various colors, but I need 84" long. Are they available 84" long." Yes they come in 84" although I purchased 63". They are gorgeous and the color is as pictured. "What percentage of cotton are in these? Mostly polyester, or mostly cotton?" Mostly polyester, synthetic with a sheen. The Pairs to Go Victoria Voile Panel Pair is made of 67% polyester and 33% cotton, with a cotton like appearance. No, it is a sheer curtain. It is a nice deep, rich color. "How deep is the rod pocket?" My rod is 1" and has some extra room but I would not get it any larger than 1 1/4"
"Can these curtains be used with ring clips?" I guess you can, you just wouldnât get a drape between clips. "Is the stated width for one or for both panels?" The width of both panels together is 118”, the width of each individual panel is 59”.